"Thank you for your friendship," Benedict tells faithful on final day as pope. Pope Benedict XVI waves to faithful from a balcony upon arrival in Castel Gandolfo on his last day as pope. 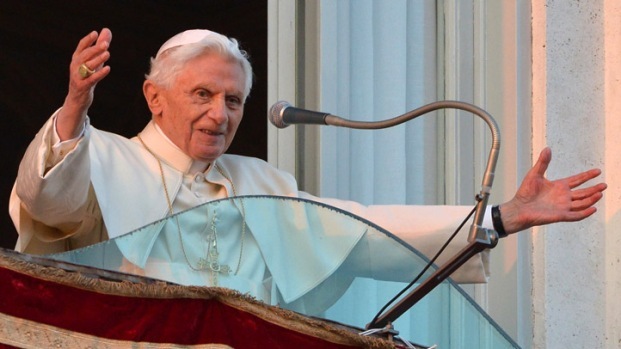 Earlier Thursday, Benedict greeted the faithful at Castel Gandolfo, telling well-wishers at the papal retreat that he is beginning the final stage of his life as simply a "pilgrim." 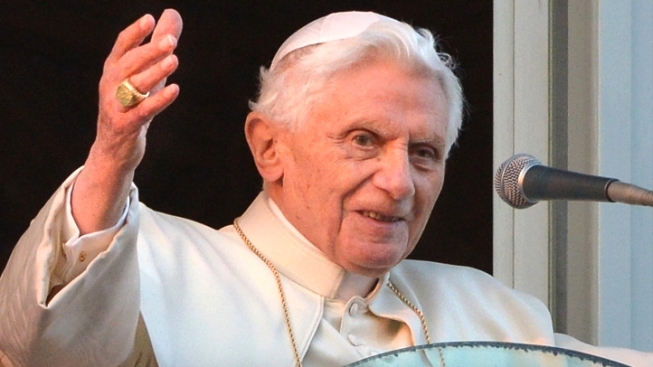 Benedict arrived at Castel Gandolfo after an emotional sendoff from the Vatican. His closest aide wept by his side as he bade farewell to Vatican officials gathered in the courtyard of the Apostolic Palace, Swiss Guards standing by at attention. Bells tolled as the pope left the Vatican by helicopter and circled St. Peter's Square, where banners reading "Thank You" were held up skyward for him to see. The bells tolled anew as he arrived in Castel Gandolfo, whose central piazza was jammed with people eager to catch the last glimpse of Benedict as pope. To a roaring cheer, Benedict, 85, appeared at the balcony of the palazzo where he will spend the first few months of his retirement. He said he was happy to be "surrounded by the beauty of the Creator" on this unique day. As of 8 p.m., he said to applause, he would no longer be pope. "Thank you for your friendship," Benedict told supporters, NBC News reported. "I am just a pilgrim." It was an emotion-drenched day that began with Benedict's final audience with his cardinals, where he pledged his "unconditional reverence and obedience" to his successor, a poignant and powerful message to close out his eight-year pontificate. Benedict's resignation will be a moment of quiet theater. At 8 p.m. sharp, the Swiss Guards standing at attention at Castel Gandolfo will go into the palazzo and shut the doors behind them and go off duty, their service protecting the head of the Catholic Church over — for now. Pell also said the church was in sore need of a strong manager — comments echoed by several cardinals who have noted the 30-year reign of two popes who paid scant attention to the internal governance of the church. The Vatican tried to downplay Pell's comments, saying it wouldn't respond to individual cardinals and urging the media not to take advantage of churchmen who, it said, aren't necessarily media savvy. "Thank you for your love and support. May you always experience the joy that comes from putting Christ at the centre of your lives," Benedict said on his Twitter account Thursday as he departed the Vatican.